The native Male Fern is an elegant addition to the winter garden. It serves as a green backdrop to flamboyant summer flowers, but comes into its own during Autumn and Winter, with its structural shuttlecock shape. 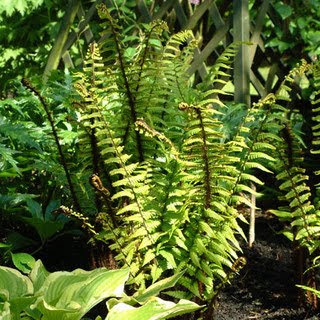 It has robust mid-green foliage and can withstand drier soil and sunnier spots than other ferns, although equally happy in damp shade. Its foliage lasts well into late winter, when at some point the leaves will fold down, forming natural protection for the crown of the plant during the wet and cold winter months. Its best to leave these until early spring, when they can be removed completely to make way for the fresh new leaves (known as fronds) to elegantly unfurl.